Above is the video I made during my time in Athens and Delphi. I’ve recently returned from my first trip to Athens and, what can I say? I’m in love! There was something electric about the place – and it wasn’t just the feel of the ouzo as it trickled down my throat and warmed my chest. I’ve been curious about Athens for as long as I can remember. As a child, I grew up with stories from my father’s adventures in the city. On his first trip, he’d purchased a black and gold Athens t-shirt and wore for it years, even after the gold lettering had faded. I remember we used to spend many lazy Sunday afternoons together listening to Zorba the Greek, a non-traditional song but one that seemed to capture the spirit of his adventure. I’ve always wondered what it was about Athens that had made such an impression on him. Clutching my bags as I stepped off the plane, I knew I was about to find out. As the capital of Greece, Athens is a bustling metropolis and one of the world’s oldest cities with a history spanning more than 3,400 years. 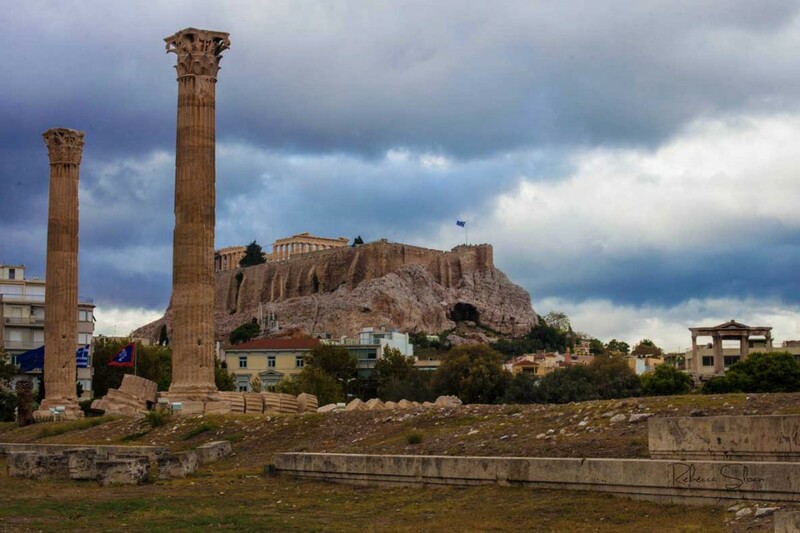 Wandering the streets of the city, you come face to face with Athenian culture from across the ages. Imposing historic monuments anchor a city bursting with energy and life; their archaic structures sharply contrast against the modern coloured strokes of local street art and graffiti. Somehow in the city where democracy was born, it seems only fitting that people scrawl their expressions across the city’s surfaces. This alleyway is covered with colourful graffiti and street art. 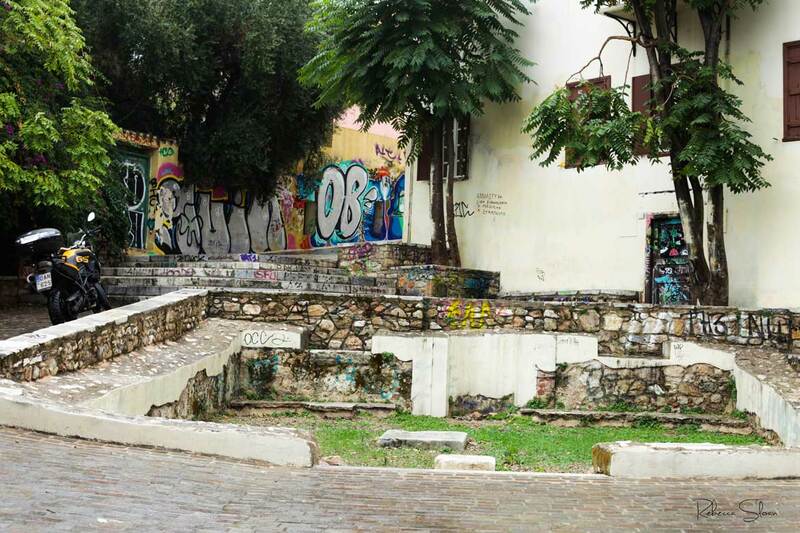 Colorful graffiti has been painted on to the surfaces in the Plaka. Two women walk up the Plaka towards the Acropolis. But the city evokes much more than artistic expressions. 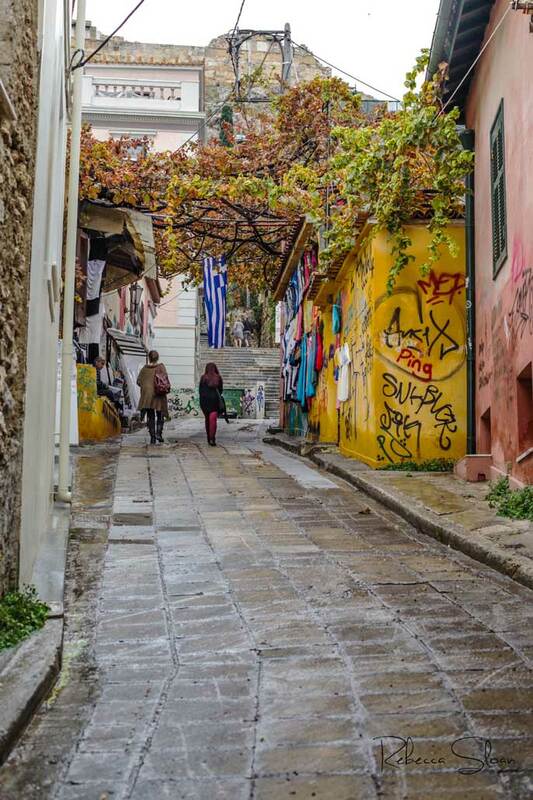 Walking down cobbled streets and across marbled squares, one can lose themselves in the romance of ancient antiquity, or simply in the footsteps of the teen-aged couple dancing to their own music under the street lamps of Panathinaiko Stadio. Ruins of the Ancient Agora. For me, it was while sitting in Mitropoleos Square when I heard the strum of those first few notes of Zorba the Greek being played by musicians at the Pandroussou Street Market party. In the pluck of those notes, the band strummed at my heart strings and in a moment I was transported back to my father all those years ago. Since leaving the city, I’ve realized that retracing his steps was a deeply personal experience for me. But it was more than ancient architecture and folklore that won me over. In my whirlwind week, I was gifted with many acts of kindness. From the young couple who missed their bus to help me find my destination and who offered me their number incase I would need further help or a translator, to the Athenian dentist who bought my friends and I a round of drinks after I mistook him for someone, to the waiter at Plakiotissa Restaurant who asked for updates on my trip and was keen to teach me traditional Greek dancing (if you’re reading this, I’m sorry I didn’t get the chance to come in – next time you’re top of the list!). These are just a few of the welcoming strangers who went over and above what was necessary to provide assistance or make sure I was enjoying my time in Athens. In a busy, thriving city, it’s not uncommon to feel alone. But in Athens, I found friends wherever I turned. It’s easy to see why my dad loved the city so much. And while I reveled in the rough texture of ancient ruins beneath my fingertips and the seductive weave of the city’s streets, it was the people who really stole my heart. I love how your video came out! I haven’t even begun to edit all my clips. Was great to meet you at the Expedia Party and still hoping you will send me that clip of the lightning over the acropolis. That was epic! Thanks for the feedback Ciaran! Also, thanks for reminding me about the clip, I’ll hunt it down for you. This is incredible how NOT like Athens is like. Its extremely (positively) biased, and tourist-y kind of view. Athens is a crapfest, take it from an athenian. We’re Athenians too. How you look at Athens is a matter of attitude! There are plenty of amazing things in this city, you only need to look for them. John you may need to change your life style. Athens is a great place to live, full of events, opportunities and activities. @GlobalGreekWorld is right. It is a same if you are not able to enjoy your life in Athens. May some unfortunately facts or the crisis are the reason for your point of view. Well done. We’ve been in Greece for eight weeks now, about three in Athens, and this is our experience exactly. So much energy and excitement, even in the off season. Eight weeks in Greece sounds amazing- lucky you! Glad to hear you’re having a great time! Hello Rebecca, just saw your post on reddit, got directed to this blog. I also saw your video and it is awesome! I’ve recently been to Athens, (and would have been to Delphi as well, if only Key Tours didn’t have screwed up my tour!!!) And I feel like I had the time of my life! The moment I stepped out of the plane, I knew I was going to enjoy that, especially after instantly falling in love with the police officer standing guard next to our plane. I shall never forget her beauty. I always wanted to visit Athens, ever since I was a wee lad, watching all those beautiful sites on the TV, the Greek flag waving atop the Acropolis… and last year I was fortunate enough to be able to visit. I will for many years to come, hold that experience on top of my list, I don’t know if any other country will be able to top that. One regret, though? Not staying for longer to enjoy more of it. A lot longer! Thank you for sharing your experience with us, I’d love to talk to you about it. Thanks for stopping by and checking out my story! I’m glad it resonated with you – it sounds like we had very similar experiences in the city. If/when you get the chance to go back to Athens, I would highly recommend you check out the Oracle of Delphi – the view there is breathtaking! 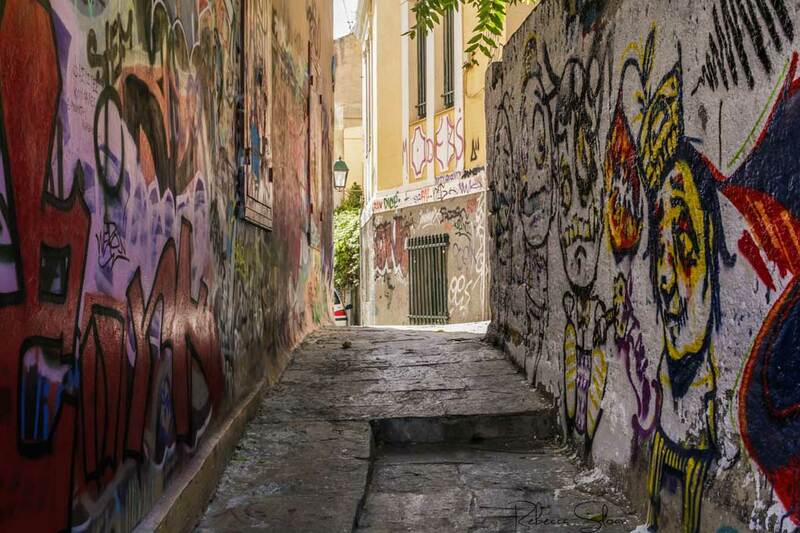 Also, Athens is now running a scheme called “This Is My Athens” which matches tourists up with locals for guided walks around the city / recommendations on where to eat/drink etc. 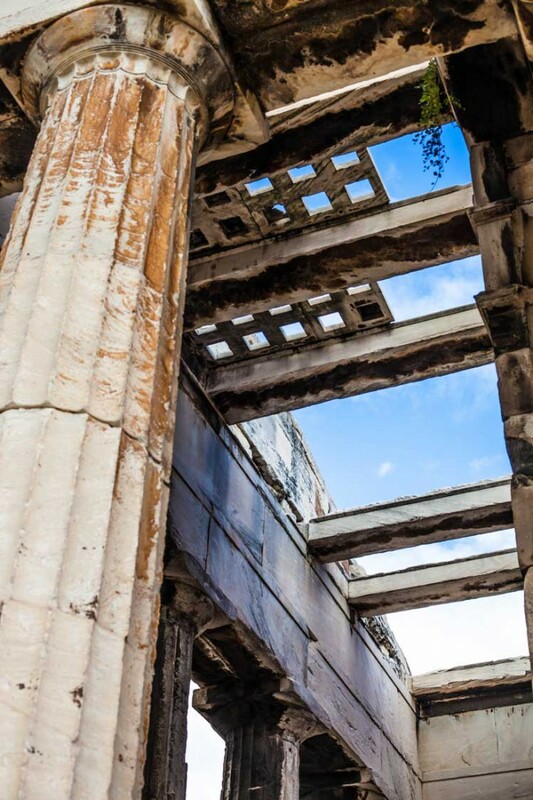 I took part in a tour during my trip and had a fantastic time – if you’re interested in finding out more, you can find details in my post “Discovering Athens; my tour with a local”. Oh, yes that interests me! Thanks for sharing. I will give it a look, and as for places to eat, well. Let’s just say I’ve found one of the best for not that much places, called The Cave of Acropolis! Hope to be back there soon! Fabrizio give me your address and I’ll send you a bottle! Thanks for your kind words Rebecca. It puts a smile on every Greeks’ face to know that people have had a good time in Greece! I started visiting Athens in ’79, lived there all during the ’80’s and part time during the ’90’s and visit every year. It’s my second home. I love Athens and will always hold it in my heart along with my friends there. I loved your video. I also go on pilgrimages to Delphi every time I visit Greece. Truly a sacred place! (By the way, I’m a travel journalist who writes mostly about Greece and my newly published novel SHADOW OF THE LION; BLOOD ON THE MOON (Volume 1 of 2 about the fall of Alexander the Great’s dynasty) is no available on Amazon. All the research for it was done in Greece. I was just there on a book promo visit just a bit before your group came to the city. Glad you had such a grand time! Thanks Ruth! Yes, the Oracle of Delphi was a stunning area and I would highly recommend it to people. I’m looking forward to visiting Greece again and seeing more of the country – I can see why you go back year after year!